A glimpse into a late-1980’s Thanksgiving. 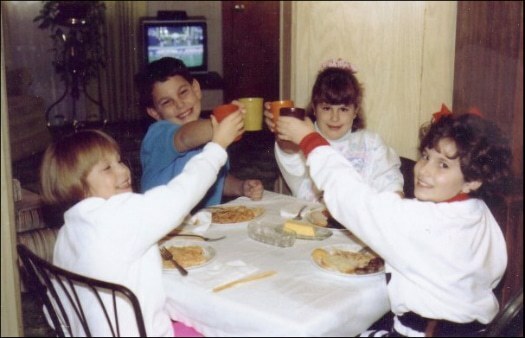 My cousins and I at the kids’ table at my Grandma’s, having ourselves a little toast with our plastic cups. The Cowboys playing their traditional Thanksgiving Day game on the TV in the background. And oh yes, we’re Italian – that’s pasta you see on more than one plate. We always had all of the traditional Thanksgiving fixings but there was always some sort of pasta option. Regardless of that, the turkey still always took center stage. We would wait impatiently for it to come out of the oven, and then hover around while my uncle carved it, little fingers constantly getting swatted away as we tried to sneak bites of the scraps. I’ve never been tasked with making the turkey on my own since we’ve always had Thanksgiving at my grandma’s but I have learned many things throughout the years, both from my family and from my own turkey recipe reading and research. As everyone starts to make arrangements to buy their turkeys this weekend and into next week leading up to Thursday, I thought it would be a good time to share some great tips for cooking that turkey! The Size: If you only need enough meat for Thanksgiving dinner, plan on ¾ to 1 pound of turkey per person. 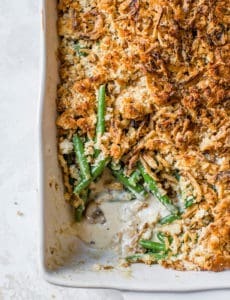 If you want enough to send leftovers home with guests or to make soup or casseroles over the weekend, up that amount to 1 to 1¼ pounds per person. Fresh or Frozen? Fresh is always preferred, but let’s be honest – we’re still in a recession and frozen turkeys are much more economical. Don’t fret over it – my motto regarding food is to buy the best you can afford. Don’t break the bank – the whole purpose of the holiday is to enjoy time with loved ones. Storage/Thawing: Keep fresh turkeys in their original packaging and place breast side up in a bowl or rimmed baking sheet to catch any juices that may escape, and keep on the bottom shelf of the refrigerator. Thaw frozen turkeys in the refrigerator, with the rule of thumb being 24 hours for every 4 to 5 pounds. So if you have a 15 lb. turkey estimate a 3-day thawing time. If you run short on time and forget to take the turkey out of the freezer, you can submerge the turkey (still packaged) in cold water, changing the water every 30 to 60 minutes. That method takes an estimated 30 minutes per pound, so that 15 lb turkey would take about 7 or 8 hours to thaw this way. NEVER thaw a turkey at room temperature, as bacteria can easily grow. Brining: Brining a turkey is a great method for preparation. Since the birds are naturally low in fat and can dry out when roasting, brining helps to keep the turkey moist and juicy. Typically brining involves submerging the turkey in a solution of salt and water, and sometimes includes additional flavorings. One of the most popular recipes for a brined turkey is Alton Brown’s Good Eats Roast Turkey Recipe. Prep: For any type of roast – beef, chicken,etc. – I have gotten into the habit of taking the meat out of the refrigerator an hour or two before I plan on putting it into the oven. Letting it come to room temperature helps to ensure that it will be evenly cooked throughout. Seasoning: Make sure you season the turkey really well (be very generous with the salt!) before cooking it. It helps to allow the flavors to develop, and will result in much better flavor than meat that is seasoned after it is cooked. I like to rub or brush a bird with softened butter all over before seasoning – it creates an awesome, crispy skin! If you cook your stuffing separately (and not inside the bird), you can fill the cavity with one or two quartered onions, carrot and celery pieces and some sprigs of fresh parsley, sage and thyme. This will help to add some subtle flavor to the turkey. Checking for Doneness: I really, really encourage everyone to invest in an instant-read digital thermometer. There are some expensive ones out there, like the Thermapen (I lust after it), but the one I bought was less than $20. I use it on a weekly basis, at a minimum. Very worth it. A thermometer inserted into the thigh, near the socket but not touching any bone, should read at least 165 degrees F.
Let it Rest: Once removed from the oven, let the turkey rest at room temperature for at least 30 minutes before carving. This is the case with most meats and roasts, as it allows the juices to redistribute and settle. 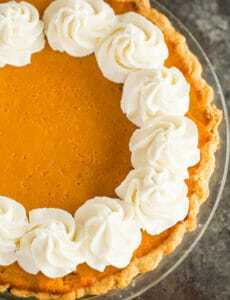 If you cut into it immediately, the juices will run out and you will be left with a rather dry turkey. Don’t cover it, or the skin will lose that great crispness. Lastly, carve it up, pour the wine, sit down and enjoy some fabulous time with your friends and family! Does your family have any turkey traditions? I’m so glad I found this – I’m cooking the turkey this year and I’ve never done it before. I’ve never even roasted a chicken – agh!!! I’d take issue with that line “fresh is always preferred.” Not really. Frozen turkeys are flash frozen immediately after processing. Fresh turkeys are kept chilled, but may take several days to get to market. If they’re commercially processed they are flash-chilled, so that they’re kept at a close to freezing temperature; if they’re processed by small local farms they are generally not kept quite as cold. In either case, they are stored at temperatures which can fluctuate and they are not really very fresh by the time they get to you. Frozen turkeys, on the other hand, if properly thawed (by which I mean left in the refrigerator for several days) are essentially in just-slaughtered condition when they thaw out. Because they are flash frozen, ice crystals don’t develop which can tear up the meat, and if they’re slowly thawed water loss will be minimal. The final product is likely to be better than a fresh turkey, unless that fresh turkey is very local and very freshly killed. And you don’t have to believe me – you could look it up. Cooks Illustrated has weighed in on this and recommends frozen turkeys. Bottom line: buy frozen and don’t give it another thought. I haven’t seen that picture in years! Love it and you, too! These are fantastic tips, Michelle! The picture of you and your cousins is wonderful. Is that you on the far right? Thanks Dara! Yep, that is me, far right :) Good eye! Love the family photo! I was always stuck at the “kid” table with all of my siblings and cousins like that too! Thanks for all the great tips! Thank you for those tips. I never know how to judge what size turkey to get so we “discuss” it until we just get one that seems right (whatever that means). I do recognize those cups! We used to use that set and we have some Tupperware storage bowls to match that we stored our leftovers in, especially Thanksgiving leftovers heeheehee. Growing up, it was a tradition that my dad would cook the turkey and he’d be cranky about it most of the day. When it came time to cut it my mom would give her two cents about how he should cut it and what he messed up last year etc, and once that was done we could eat! Hahaha! It’s a fond memory now and we all joke about it. “It’s not Thanksgiving unless dad yells about the turkey!” Now I can’t wait for Thanksgiving. I was just given a digital thermometer at the Foodbuzz fest, sounds like a turkey will be the perfect thing to try it out on:) Sounds like a great recipe! Nigella Lawson has a really fabulous brine recipe too that is in her “Feast” cookbook. Her Christmas specials are mesmerizing, mouth watering, and down right inspiring! You can find clips of them on You Tube and in one of them she makes her turkey brine. YUMMY! Thanks for the tip! I’ve been meaning to pick up one of her books. Great tips! 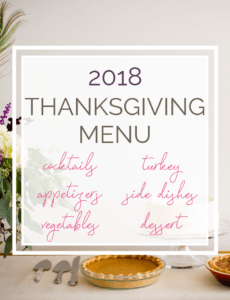 I’m working on a roundup of Thanksgiving info for my Friday Favorites post this week, and I’ll definitely include a link to this post! I love that picture! So ’80s and in an imagine totally conveys the feeling of family and Thanksgiving. In addition to the usual dishes served with the Turkey, my mom would always make German Potato Salad. I think my Grandmother who was from Germany started that tradition. I do it now too. Hmm I’m not sure, I’ve actually never had German potato salad! But a big ol’ WOOO for the Oakmont Bakery! Their stuff is the best! I’ve still never cooked the Thanksgiving turkey myself either, but I’m so excited for the day that I get to! I should make practice turkeys inbetween…that would make me happy!